Apparently there is a big hole in my wardrobe. I am running out of simple easy to wear dresses. I want some variety in my outfits (this scab still around from January’s surgery is controlling what I can wear without using a band-aid). I even tried looking at RTW stores for just a simple t-shirt style dress. No one had any t-shirt style dresses! I am about ready to go raid my sister’s closet for t-shirt style dresses to wear. Actually it is more like send my dad over to raid her closet for me. I decided to make the Deer & Doe plantain top as a dress now for a couple of weeks. But I had troubles finding decent knit fabric on a reasonable sale price. Eventually a nice stripe showed up at the fabric store (maybe a little thin) plus I was able to dig a rose-colored one out of stash. I was going to wait until after the 1960s cranberry pink dress I am currently working on, but decided this can’t wait too much longer. I cut a 42 at the bust and graded out to a 46 at the hip. Then I added about 15 inches to the hemlines to make it dress length and continued the side seam curve out to the new bottom of my pattern piece. 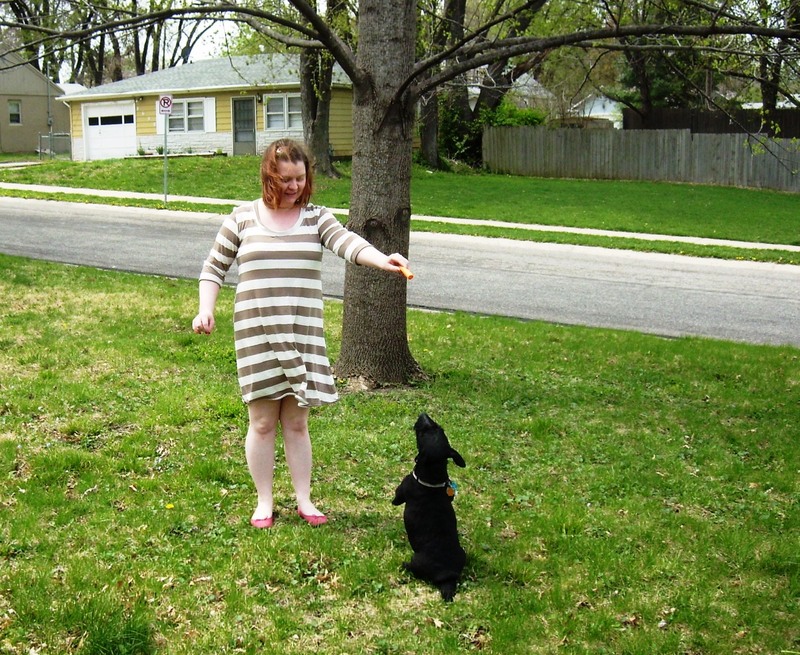 At the Deer & Doe blog, they do have tutorial for a baby-doll style dress using the plantain pattern. I didn’t bother to follow this because I wanted just a simple t-shirt dress. I may have to re-visit this tutorial at another time. I got all the pieces cut and assembled in one night (probably about a 2 ½ hour time frame). I used my serger to assemble everything so it was quick. But I felt like I wasn’t as accurate with using the serger as I would have been with a sewing machine. Second night I worked on my dress, I mainly had left shortening the length, shortening sleeve length, and hems. The sleeves ended up being about bracelet length on me. So I shortened it by about 2 inches. 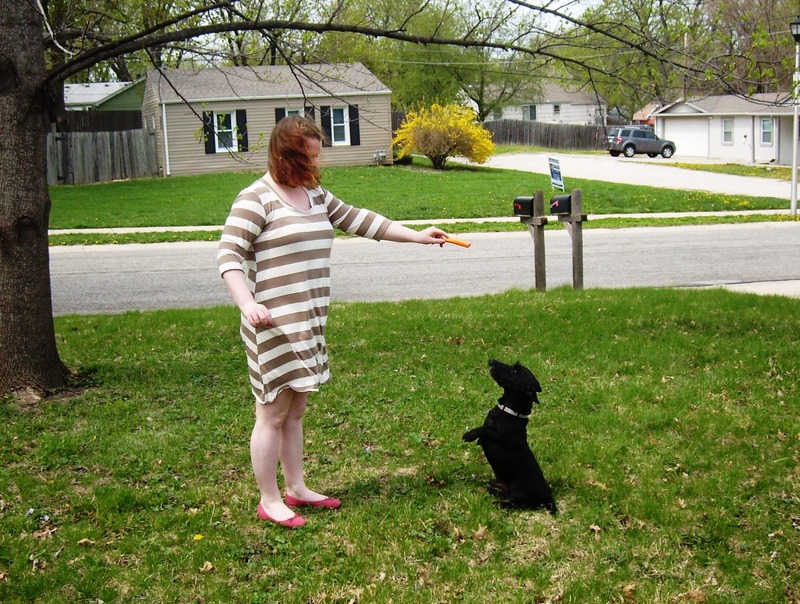 Then I went back and shortened the dress length about 4 inches. I tried to line the stripes up at the side seams. Apparently I was only successful at getting one side to match. It is kind of disappointing. The bottom layer of the fold must not have been as even as I thought. Next time I try this I may go ahead and lessen the taper on the sleeve pieces. My sleeve feels a little too clingy. Hopefully next week, I will be able to post the cranberry pink dress. I also need to get my vintage pattern ready for Pattern Review’s Vintage contest. The blog may have been sitting idle for over a couple of weeks now. But the sewing machine has not. I have one completed project waiting for pictures. Sunday was too rainy for me to get my dad to take pictures of it. I am about 80% completed on another project. 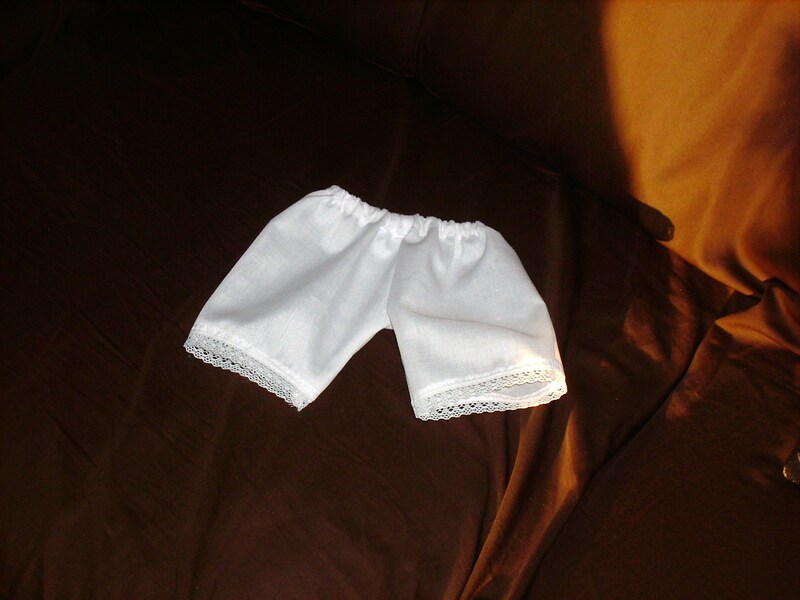 This weekend I all of a sudden decided that my dolls needed some white fabric for some undergarments (and Felicity’s mob cap). So for thirty minutes on Saturday, I was cutting out several different undergarments from the Pleasant Company’s Kirsten’s Pretty Clothing. All total, I got two pairs of pantalettes, two chemises, and two petticoats cut. The pantalettes came together very quickly. I think it took me 30 minutes to complete. I actually didn’t look at the instructions until after making the pantalettes. The pattern piece has elastic casing mentioned. The instructions list a different method for elastic then what I thought elastic casing was. The elastic is zig zagged onto the pantalettes. I actually made a casing and threaded it through. So that explains why I thought my pantalettes looked a little short on Marie Grace. First model is Marie Grace. She was sort of Christmas present/ get better present/ and my state tax return. 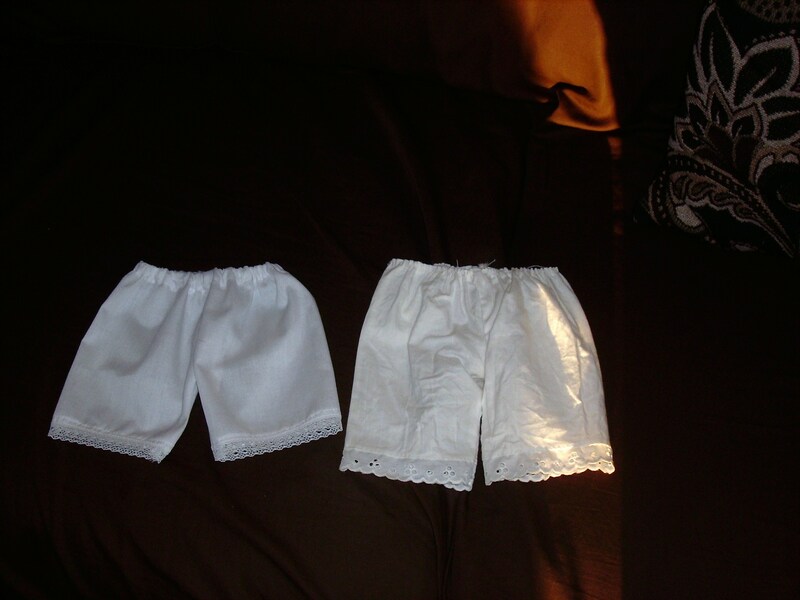 I compared Marie Grace’s pantalets to the ones I made. 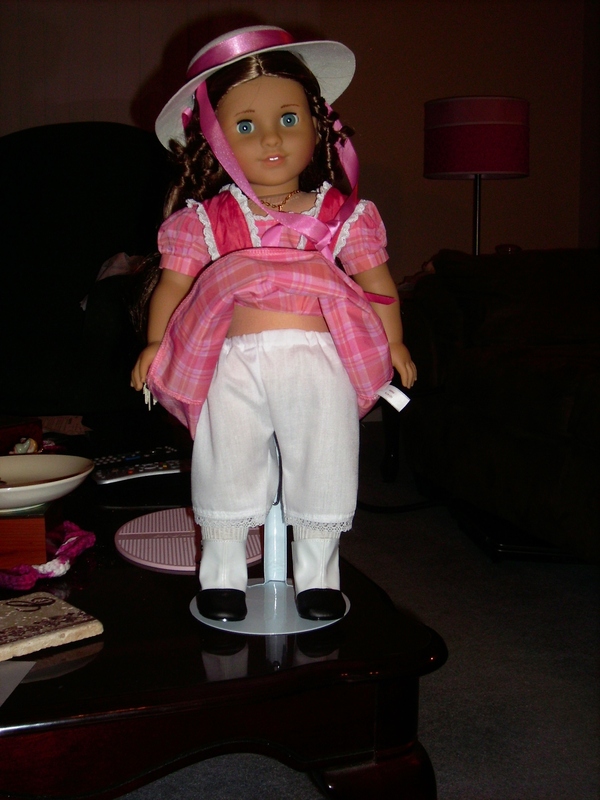 The ones from Kirsten’s Pretty Clothing are much looser in the leg than the ones from American Girl. This could be from changes in the dolls from now and when the pattern was made in 1990s. The waist is loose on Marie Grace too. If I get time, I may go back and change elastic in the waist to fit all dolls better. I made the pair on the left. 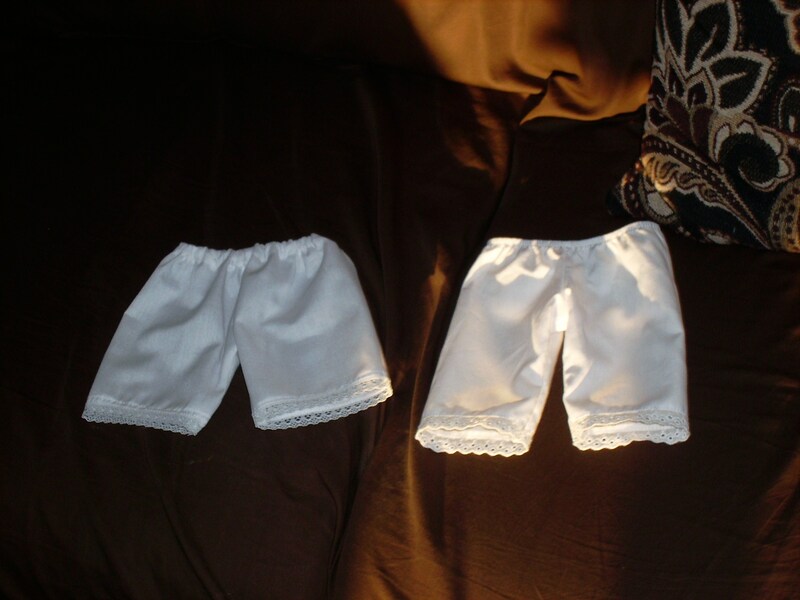 Marie Grace’s original pantalettes are on the right. I went ahead and checked Kirsten. This will be the major decider if it is changes in doll or not. And it was definitely changes in the doll. The pantalettes were much more fitted on Kirsten. A side by side comparison of the two is below. The ones on the right are Kirsten’s original pantalettes. Left is the pair I made. The crotch curve for the pantalettes flares out at the waist. It puts a point in at the center back and center front. I don’t see why it is cut like this. I think next time I use this pattern for pantalettes, I may try changing the curve at the waist to be more vertical. I didn’t get a chance to work on the petticoat or chemise yet. I will post those when they are done. I did notice that Butterick 6035 does have a chemise and pantalettes. I may try out that one to see how it compared to the Pleasant Company pattern.